Optical plate manufactured with high accuracy polishing & flatness tolerance. 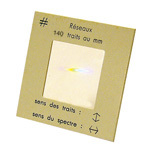 Made of standard optical glass (index near to 1.52). 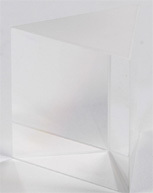 Hollow prism to fill with different liquids in order to study diffraction. The transmission sinusoidal grating (or holographic grating) allows an easy understanding of the notion of Fourier's transform. Transmission gratings in the shape of slide. Triple grating with 100, 300 et 600 lines/mm.